The Miami is a modern two bedroom skillion roof kit home offered by Valley kit homes. The entrance from a 16sqm front deck leads into an open plan kitchen, lounge meals area. The main bedroom is separated and has a full length robe. A good sized bathroom is adjacent with a separate toilet. The second bedroom also has a full length robe and the hallway houses a laundry nook and storage. 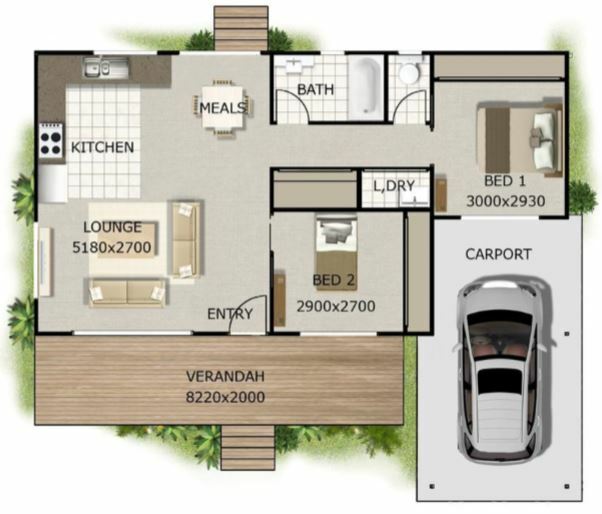 At 102 sqm including verandah, the full kit is priced at $48,400. Go to Valley kit homes site here.